It's a common question among precision rifle shooters. How tight should the action screws be? Why? What is the best way to tighten them? Are they necessary at all? Some shooters claim they can "tune" their rifle's accuracy by precisely tightening their action's screws. In a nutshell, action screws are there to keep the stock attached to the barreled action. Simple enough. But precision shooters seldom leave good enough alone. In the pursuit of accuracy, every element of the rifle is open to improvement. The goal is to create a good attachment that will consistently support the rifle's barrel and allow it to vibrate the same way from shot to shot. It turns out this isn't quite as easy as you might imagine - the forces involved can be significant. Think about what happens when you fire your rifle. The bullet takes off down the barrel, creating a recoil force on the rifle that will be perfectly in line with the barrel center line. 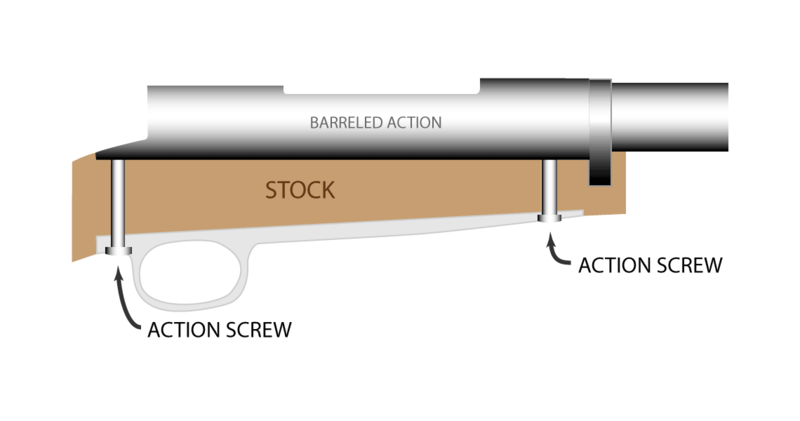 That recoil is typically transferred to the stock through two mechanisms - (1) the recoil lug and (2) friction between the action and stock generated by the clamping force of the action screws. In a solidly bedded stock, the recoil lug will be in firm contact with the stock. The recoil force will travel through the barrel to the lug and finally into the stock. If the rifle's bedding is sloppy and the lug to stock contact is not solid, the friction of the stock to action contact is all that keeps the barreled action from slipping in the stock, which will cause the lug to bear on the stock. Now, it turns out that action screws are capable of exerting a lot of force - on the order of 1,000 pounds per screw, depending on the particulars. 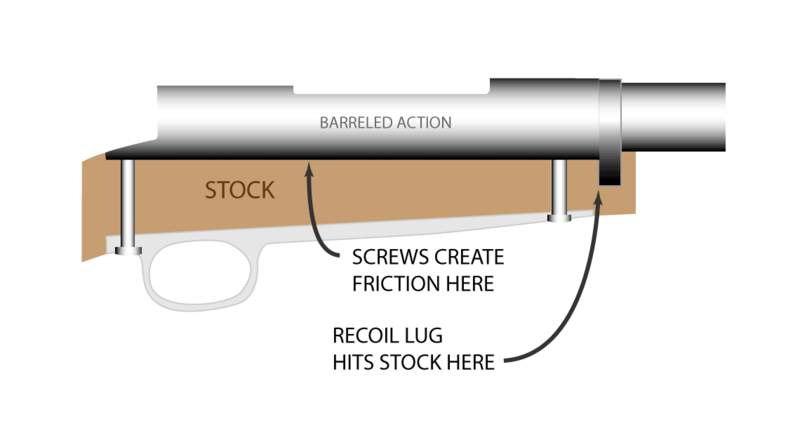 That means the friction connection will absorb a good portion of the recoil force before the action slips enough for the lug to make contact and start transferring load. So step one of getting the most out of your action screws is to reduce their impact by using a good, solidly bedded recoil lug. But not being one to leave well enough alone, there's more to it than that. Even with a solid bedding job, it seems prudent to create as consistent an attachment between action and stock as possible. But it's not that easy. Wood and plastics (even composites like fiberglass or carbon fiber) exhibit a material behavior known as "creep". Materials that creep deform slowly over time when placed under load. Silly putty is an extreme example. You can roll it into a ball, and leave it on the table. Come back a couple days later and it will no longer be a ball but a puddle. That's creep. All that material between your trigger plate and your action is being constantly squeezed by high forces (that thousand pounds per screw). That constant pressure will cause the stock material to creep out of the way, and the the clamping force to decrease over time. Consistency is the father of accuracy, they say. Some thoughtful shooters have taken to using a torque wrench to tighten their action screws prior to shooting. If you tighten them the same right before shooting, the theory goes, you'll have the same clamping force and better accuracy. If only that were true. The friction constant (k) is an empirically derived number that typically ranges between 0.1 and 0.5. Precise, clean, well lubricated threads will have a number closer to 0.1. Rough, dirty threads will be higher. A rule of thumb for regular dry screws is to use 0.2. For example, a torque of 40 in-lb on a 1/4" screw with clean dry threads (k = 0.2) will exert 800 pounds of clamping force! But did you notice how variable that pesky friction constant was? Simply adding a decent bolt lube to the screw can take your friction constant from 0.2 to 0.1, which doubles the clamping force. What this means in practice is that torque is a bad way to precisely regulate a screw's clamping force. A rule of thumb is that you should be able to get within 25% or so with a torque wrench, which is better than nothing, but not exactly precise. Metals like steel and aluminum do not creep. You can clamp them all day long and they won't budge. But making a stock out of metal comes with sometimes undesirable downsides. Enter "pillar bedding". 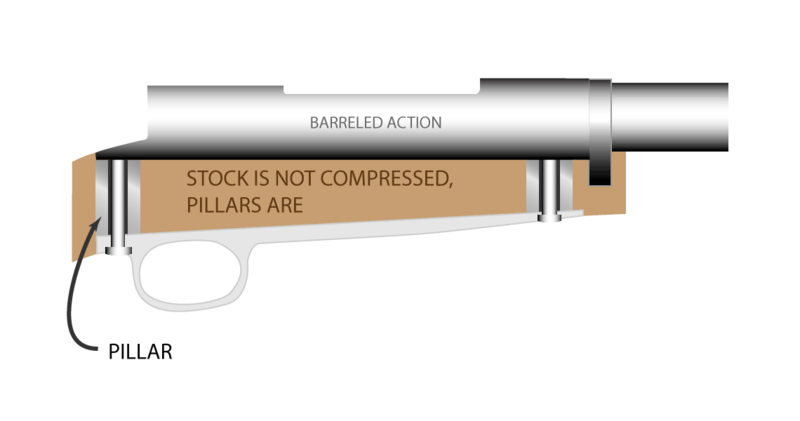 Pillar bedding is the technique of inserting metal tubes between the action and the trigger plate. Those tubes are permanently glued to the stock and the action screws run down the middle. What this accomplishes is that the pillars, being significantly stiffer than the stock material, absorb the vast majority of the clamping force. As a result, there is no creep since the stock is not under any pressure - it's (almost) all absorbed by the pillars. So now we've solved our creep problem. But what about the inconsistent clamping force problem? I've shown you why torque wrenches are not all that helpful. So what is? Well, one of the best way to measure the clamping force of the screw is to measure the length of the screw under load (that is, when it's tightened) and compare it to the unstressed length. You will see that the bolt actually stretches a little. That stretch is very consistently proportional to the clamping force. But how do you measure such a thing? You can't exactly whip out the calipers and measure the screw inside your rifle. You can, however, do something similar. If you use precision, high quality screws, and precisely machined, clean pillars you will be able to use a very simple technique. Just tighten the screw to the point where the screw head just touches the pillar and there is no wiggle or play. At this point, there is no bolt stretch or clamping force to speak of. Next, turn the bolt head until you have your desired clamping force . The angle through which you turned the screw head will be proportional to the bolt stretch, which will be proportional to the clamping force. You can use a torque wrench to figure out how far you need to go, but once you've found the right angle to torque to - use that, not the torque wrench. It's not perfect - this method is a little fiddly and requires precisely machined parts, but is generally considered a more accurate method than using a torque wrench. This article just scratches the surface of the technology behind the lowly screw. There are other techniques used in the aerospace industry for critical bolts - load sensing washers and ultrasonic bolt stretch detectors, for example. They are expensive, time consuming, and frankly, bordering on voodoo at times. It makes you wonder if action screws are a bad design. So why not just forgo your action screws and just glue the action to the stock, as many benchrest shooters do? Actually, after writing this article, it's looking like more and more like a good idea when done by an experienced gunsmith. I'm still waiting for the best way to unite the stock and barreled action that doesn't require glue - perhaps this article gave you some ideas. The action screws are there to do one thing: hold your action securely in the stock. To accomplish this, you'll need a good bedding job, preferably with pillars or another creep-free design. Torque them reasonably and consistently, and forget about it. If you find your action screws are dramatically impacting your rifle's accuracy, you might want to look into your stock and/or it's bedding job.